We have various types of terrain, hard solid rock (very rough and sharp), loose boulders on rock, mud (in winter only), loose clay slopes etc. Unfortunately some new legislation has been enacted a year or so ago which practically prohibits all off-road activity in Malta. Actually if you interpret the law to the letter, there are more places you can go with an ordinary car than with an offroad vehicle! The most common off road vehicles here are Land Rovers of all ages and a mix of Suzukis, Japanese Pickups, ARO (Romanian stuff). There are also various vehicles from Korea and India such as Mahindra, Bajaj(! ), Tata (not Tatra), Ssangyong and Maruti, though their appearance off the road is quite rare. Toyota Land Cruisers are very rare off the road but common enough on it (the independent front suspension type). American vehicles are really rare - only know of one Chevy and a couple of Cherokees and Jeeps but not a single Humvee. There are also quite a few ex-WWII Willys jeeps on the road. The government and the armed forces own a few ex-Gulf War 'jeeps' (independent suspension - Ford I think). There are two offroad clubs. The AWDC (Malta) is affiliated with the UK AWDC. The other club is the 4xFun club. The AWDC is more biased towards extensively modified vehicles and sponsored competitions while the 4xfun caters more for green-laning and competitions which do not require modified vehicles, though there is a lot of overlap between the two clubs. Here in Malta, as I mentoned, the most popular offroad vehicles are Land Rovers. 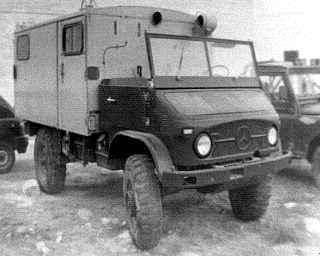 I had been thinking about getting one for ages but despite them being excellent vehicles I decided to go a bit further for what several would agree is the ultimate offroader - the Unimog made by Mercedes-Benz. I bought one second hand without licence plates and it took me ages to sort things out and get a licence for it. After getting the licence I only used it for a short while before starting a major overhaul which I completed last December soaking up quite a bit of cash in the process. There is still some work to be done, such as proper tuning of the engine, repainting the bodywork and so on but at least its now on the road. Unfortunately there is also a bad oil leak from the rear end of the engine, shouldnt be serious but I'll have to remove the engine to fix it. fully syncromesh gearbox down to the lowest gear which means that unlike most four wheel drives there is no separate tranfer lever and no need to stop to change between low-range and hi-range. extreme wheel travel due to coil springs all round and flexible chassis with pivoted superstructure. 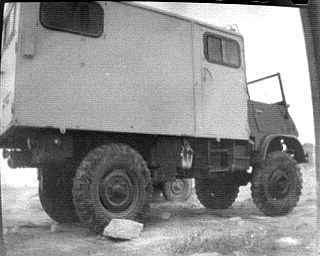 The axle assemblies are pivoted only at the centre of the vehicle by a huge ball joint type coupling and located laterally by panhard rods. The picture says it all. low center of gravity despite the high ground clearance due to thoughtful design of the chassis/engine/gearbox layout. very robust underchassis since the propshafts are fully enclosed in rigid transmission tubes. 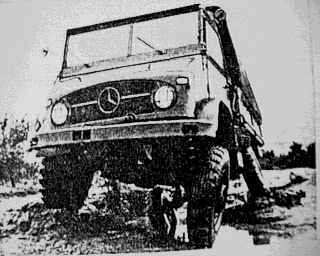 Thus the only load the propshafts will ever take is the torsion due to the transmitted torque unlike almost every other 4x4 whose shafts and universal joints must also resist impact with the ground and high obstacles. Also, there are no delicate supension linkages or low lying transfer box to get broken.